The 3.5" #709 straight locking hairmostat is designed to pull hair from the ears of dogs. 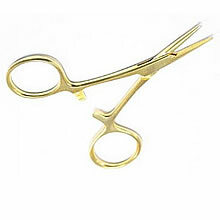 Nice looking hairmostat for ear hair pulling and tick removal. 3-1/2" Gold Edition with Locking Clamps.